Holiday villa with a private territory of 18 acres for rent at the lake Plateliai - one of the most picturesque lakes in Lithuania. It is the largest and deepest lake in Samogitia (Lithuanian: Žemaitija). The lake covers an area of about 1200 ha, length - 8.4 km, the average width - 3.3 km, the deepest place - 50 m. It has 7 islands with a total area of 20.5 hectares. The shore of the lake Plateliai is sandy and shallow - a great place to swim for adults and children. Recreation at Plateliai - great choice for both quiet rest lovers and active leisure enthusiasts. In particular, we recommend to choose this place for holidaymakers who like water entertainment. The lake is ideal for windsurfing and kite surfing, as well as yachts, boats, water bikes. Diving enthusiasts - the lake has a number of diving clubs. The villa "Plokštinė, located about 100 meters from the lake, perfect for a family or two-family vacation. The villa is comfortable for vacation for up to 10 persons or an event for up to 20 persons. TV in a living room. During your recreation at the lake Plateliai, you will be able to visit lots of interesting places of Samogitia National Park, enjoy water sports, ride bicycles (nearby there is a renewed bicycle path, that stretches 25 km around the lake), fishing. SPA center - 500 meters. A perfect refreshment for lovers of water treatments and sauna. The SPA center is equipped with a modern 80 m2 swimming pool with swim against the current device and a waterfall. Pool water temperature of 27° C, as well as Jacuzzi (34° C), two saunas - Finnish sauna and steam sauna (Turkish). Rustic sauna and hot tub - 600 meters from our villa. In high season minimum rental period is 2 nights. In off-season on weekends minimum rental period is 2 nights. Countryside tourism in Lithuania in Plungė district. Holiday villa "Plokštinė" at the lake Plateliai. Perfect place for quiet and active vacation. 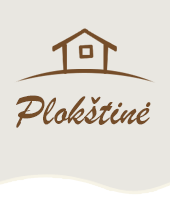 2019 © www.plokstine.lt - Villa in Plunge district at the lake Plateliai "Plokštinė"